Interstate 271 forms a bypass for regional traffic to the east of Cleveland through Summit and Cuyahoga Counties. The freeway connects with I-71 near Medina and I-90 near the shore of Lake Erie. The northern half of I-271, from Macdeonia to Wiloughby Hills, navigates through an array of cities and villages. This includes a dual freeway configuration northward from I-480N at Warrensville Heights. South through the city of Bedford Heights and the community of Oakwood, I-271 combines with I-480 along a four mile overlap. The concurrency represents just one of two pairs of branch routes merged within the Interstate Highway System. The other is I-785 and I-840 at Greensboro, North Carolina. The southern portion of Interstate 271 through Summit and Medina Counties remains mostly rural. This includes a stretch through Cuyahoga Valley National Park. A set of rest areas line both roadways in Richfield Township as well. Interstate 271 projected in 1962 along what ultimately became part of I-480. 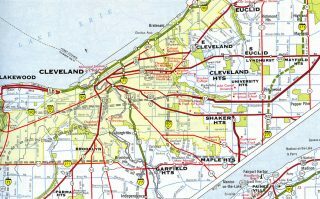 Early plans for the Cleveland Interstate system outlined Interstate 271 following a corridor along Ohio 17 east between I-71 in southwest Cleveland and Maple Heights. This was later changed to I-80N and then I-480. 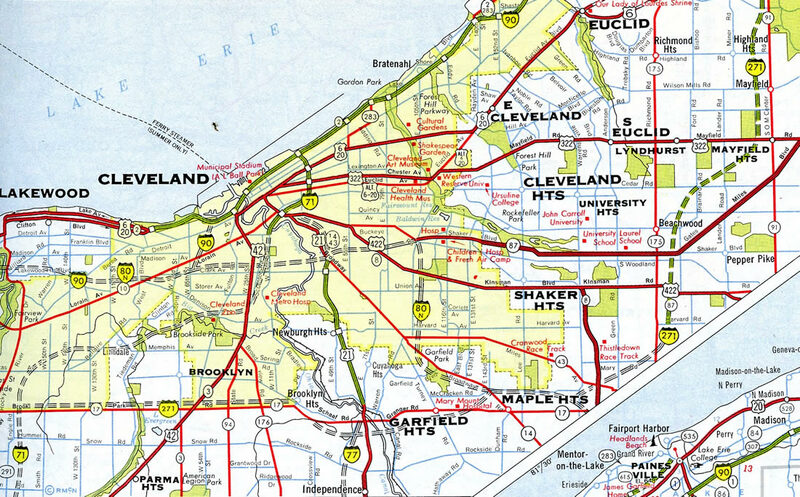 A subsequent proposal combined I-271 with Interstate 290, which was an urban freeway slated to run west from Beachwood across Shaker Heights to I-77 (Willow Freeway) in Cleveland. Approaching the junction with Interstate 90 and Ohio 91/Center Road (two miles) on the express lanes for northbound Interstate 271. I-271 has an express/local configuration between Interstate 480 and Interstate 90. Photo taken by Tim Kubat (April-June 2006). A slip ramp joins the northbound express lanes with Ohio 91 (Center Road) ahead of the merge with Interstate 90 east. Photo taken by Tim Kubat (April-June 2006). Northbound Interstate 271 (express lanes) concludes at Interstate 90 with an end sign. Photo taken by Tim Kubat (April-June 2006). Traveling east on Interstate 90, the first signs for Interstate 271 south appear on the overheads at the Ohio 2 split in Euclid, Ohio. The left two lanes continue the Ohio 2 freeway east to Painesville, while the right two lanes follow Interstate 90 east. Photo taken by Tim Kubat (April-June 2006). Eastbound Interstate 90 reaches Exit 185, Ohio 2 east to Painesville (left exit). The pull through overhead sign again includes an Interstate 271 south reference. Photo taken by Tim Kubat (April-June 2006). The next exit along eastbound Interstate 90 (and southbound Interstate 271) is Exit 186, U.S. 20/Euclid Avenue. Photo taken by Tim Kubat (April-June 2006). Eastbound Interstate 90 (and southbound Interstate 271) reach Exit 186, U.S. 20/Euclid Avenue. Photo taken by Tim Kubat (April-June 2006). The next exit along eastbound Interstate 90 is Exit 187, Ohio 84/Bishop Road. Photo taken by Tim Kubat (April-June 2006). After the Ohio 84 interchange, the next exit along eastbound Interstate 90 is the split with Interstate 271 south (Exit 188). The right two lanes connect to Interstate 271 south, while the left two lanes continue east on Interstate 90 toward Erie, Pennsylvania, and Buffalo, New York. Photo taken by Tim Kubat (April-June 2006). Exit 188 leaves I-90 east for Interstate 271 south. Photo taken by Tim Kubat (April-June 2006). Traveling west on Interstate 90, the first advance signage for Interstate 271 is this sign for the left exit for Interstate 271 Express Lanes south. Note the control city of Columbus, since Interstate 271 forms part of the bypass of Cleveland for traffic connecting from Interstate 90 onto Interstate 71 south. Photo taken by Tim Kubat (April-June 2006). This diagrammatic sign shows the lane configuration of the Interstate 90/271 split for express lanes at Exit 190. Photo taken by Tim Kubat (April-June 2006). Sign bridge for the Local/Express lanes of Interstate 90 west. The Express Lanes exit is shown as Exit 190, but the split of Interstate 271 Local Lanes south occurs at Milepost 188. Photo taken by Tim Kubat (April-June 2006). The left two lanes of Interstate 90 transition onto Interstate 271 Express Lanes south. The right three lanes continue west on Interstate 90, which will be cosigned as Local Interstate 271 until the split at Exit 188. Photo taken by Tim Kubat (April-June 2006). Traveling south on Interstate 271 southwest of Remsen Corners ahead of the final interchange: Exit 1 for I-71. At Exit 1, all traffic on southbound Interstate 271 is directed onto Interstate 71 south to Columbus and Cincinnati. There is no direct connection to Interstate 71 north. Photo taken by Tim Kubat (April-June 2006). An Interstate 271 Ends sign is posted about one and a half miles prior to the interchange with Interstate 71. Photo taken by Tim Kubat (April-June 2006). Interstate 271 approaches Exit 1, Interstate 71 south. Between 2000 and 2006, the signs were changed, and the lane allocations changed when the signs were chanegd. Photo taken by Tim Kubat (April-June 2006). Interstate 271 merges with I-71 south beyond a sharp curve. Photo taken by Tim Kubat (April-June 2006). As Interstate 71 continues north, it widens to accommodate exit only lanes for Interstate 271 north. From here, Interstate 271 travels northeast to bypass Cleveland and serve the eastern suburbs. After a brief overlap with Interstate 480, Interstate 271 has a local-express configuration for its remaining miles until reaching Interstate 90 in Willoughby Hills. Photo taken by Tim Kubat (April-June 2006). Northbound Interstate 71 splits with Exit 220, Interstate 271 north, at this ramp. The right two lanes depart to the northeast, while the left three lanes continue north toward Cleveland. Photo taken by Tim Kubat (April-June 2006). Former button copy sign for Interstate 271 north on I-71 north. Photo taken by David Greenberger (12/99). Page updated August 29, 2009.